Matchup advice for new players. If you just got Musket Smoke and want to get into the online action quicker, then sometimes you have to bypass the ‘New Player Safe Zone’. New players don’t play online a lot, they are often too busy training in the ‘Solo Training’ area or shy about that first matchup. The most active player pool in Musket Smoke is the ‘Random Opponent’ player pool. This is where everyone is mainly. So create a couple matches. One in the ‘New Player Zone’ and then create another in the ‘Random Opponent’ area. The most active area is easy to get to. Tap on the button until it says ‘Random Opponent’ and then hit the ‘Create Mini Match’ button. The 2 major Musket Smoke gameplay changes. 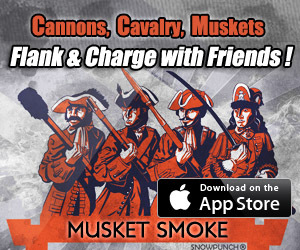 The Musket Smoke Classic, 1.55 update has two big things to keep in mind. Your overall Naarden strategy and your Mini Matches will be different with the new Light Mortar. In the Naarden Campaign two of the battles have swapped place. So Campaigns now start with “Winter Keep” and “The Breach” is now the 5th battle. This means that Winter Keep will get played a lot more and being first it also means both sides will always have the exact same units. It will be a grand first contest featuring all the unit types and will give Commanders the right kind of environment to grow and really get a quick overview feel of the Campaign. However, there are side effects to this change that will make battle 5 (The Breach) tricky and put more weight on needing to win battles 2 (and 4) or more weight towards taking out SF units. Mainly, the Mortar unit won from second battle “Howitzer Bridge” will certainly influence the wall battle. Likewise, an extra ‘Siege Cannon’ won from ‘Cannon Showdown’ will also have an impact. So you probably don’t want to lose both those battles and have 2 Mortars and 2 Siege Cannons on the other side of that wall. However, if that does happen don’t forget that Leader units can damage the Keep as well – very effectively. If you have 1 or 2 extra leader units that could help, but really you don’t have to worry ‘that’ much. With your losses you will have extra elite pikemen which if you play defensively can still keep you in the fight. Plus don’t forget if 3 mortars are active on this map all the smoke will reduce the siege cannons options. With an extra siege cannon on one side the wall breaches will happen faster so be prepared for that and don’t forget that a whole in the wall is a ‘two way street’. I actually think it would be an exciting situation to face double artillery on the other side of the wall. This would be an excellent opportunity to take out those SF units (with all the smoke and wall holes) they will likely be a bit more vulnerable. 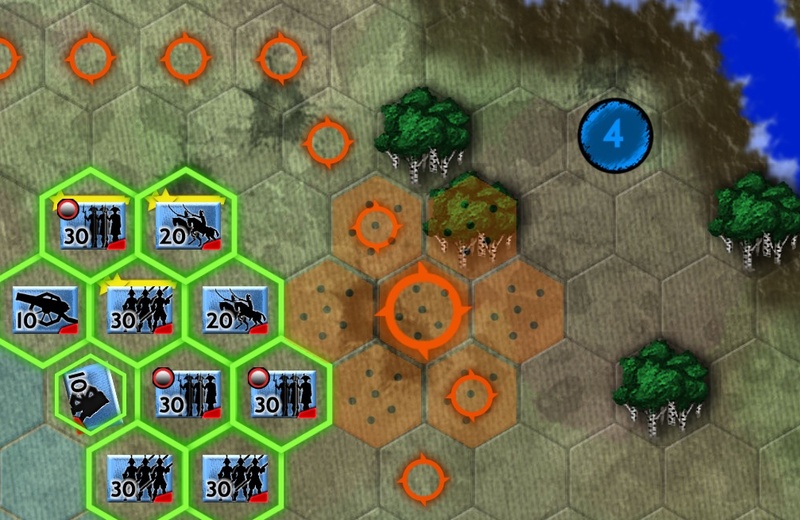 An opponent with an extra artillery advantage will likely be over confident and will have less patience than you. In this underdog position my Commander will probably focus on killing these elite units over going for a battle win. Just make sure you have time to stretch out the battle, that means you need to put your single mortar behind your keep and let the opponent try and breach your side first (so you can quickly reduce his army size). Remember you have more men on the ground so as long as you can keep your Keep protected with thick smoke your larger army can wear away at the enemy and will have a good chance at a victorious outcome. The second major change with the update is the new ‘Light Mortar’ unit added to the Mini Matches. This low damage, non-random mortar will allow you to accurately paint the battlefield grey with thick smoke that will instantly interrupt ranged weapons from aiming at targets. Just remember to look at the wind indicator as that will tell you which direction your smoke will float to when it’s your opponents turn. If you are using it to protect units from ranged fire remember that units on the inside edge of the thick smoke are still targetable. You need at least 1 full hex of smoke between you and the shooter to prevent direct targeting. The damage is only 2 for a direct mortar hit and 1 for splash damage, but if the target is locked the damage is double. So this means it will create a gore pile if the target locked. Another thing to note is that even the 1 splash damage will cause a morale hit to low confidence units that are upon gore piles. You can see an example of mortar causing a gore pile rout here. Note: the 1.55 update is still processing in the app store. It should be out any day now. Behold! The new App Store 30 second “Video Previews”. The App Store now has Video Previews – instead of just screen shots. iOS developers can now display a 15-30 second video right beside the screen shots. Do you have an app in the app store? Then you better get your preview up or be left behind with your pants down! This is the preview I am using at the moment for Musket Smoke. 1) Update your device to iOS 8. Your device must have a lightning cable or it won’t work. 2) Connect the lighting cable to Apple’s new OS X Yosemite. I put the developer preview of Yosemite on a USB 3 jump drive. Then (in Yosemite) you can take the video directly from your device with no lag using just the quick-time player. You also need Yosemite to upload the video to iTunes Connect, but first you have to resize it. 3) Apple has a pdf how to do prepare and resize your video with Final Cut Pro (ie: 1200 by 900 for landscape iPad games). There is currently a 30 day trial version if you don’t have the software. Soon all apps will have a 15-30 second video in the app store. I just hope Apple updated their servers to handle EVERYONE browsing video after video. This will likely start a new boom in people browsing for apps via the app store. Also it will be a great way for people to share gameplay videos with each other (or developers for bugs) when Yosemite OSX comes out (likely OCT 19, 2014). So this is epic in more ways than one. It will be big for for consumers, developers and even online game communities. I also believe these new App Store video previews will help games with strong gameplay get a bit of a leg-up on the less playable titles. No longer will a pretty picture be enough. If you don’t show something real and solid, then people will pass on downloading your app. New Light Mortar unit for Mini Matches. Work for update 1.55 might be completed today and will include a unit that should shake things up quite nicely in the mini matches. The update also includes swapping 2 Naarden battles. Battles 1 and 5 will be swapped, allowing more people to have access to the great Winter Keep battle right from the get-go. This is the new Light Mortar. It should help you get closer to defensive players and make aggressive assaults more popular again. When faced with a defensive stand-off, carefully bring this unit forward to gain some interesting tactical options. It’s a low damage 2 damage hit (1 for splash) unit, but the thick smoke instantly prevents ranged targeting and so a row of muskets with a cannon behind them should be less intimidating. Unlike the higher damage Mortar from the Naarden campaign, the Light Mortar’s targeting is is not random so your smoke will always be well placed.